Zum Bartewirt is located in Kreuzstraße, a very small village near Aying about 27km south east of central Munich. It may be a bit confusing that the village bears the name of a street, but Kreuzstraße refers to the crossing of two streets, which has been an ideal location for restaurants and guesthouses for ages. The Kreuzstraße settlement dates back to 1811 when there were only the two families living here; one of them being the Riesenberger "Bartl" family. In 1837 The Graf Arco family built a chapel in the village which has a 49 pounds bell. In 1614 the Graf Arco family moved from Tirol to Bavaria. In 1812 the family inherited the Adeldorf castle including the estate and a nearby brewery which had been brewing beer since 1671. During the years to follow, they also inherited the Valley Castle with a brewery as well as the Birnbach brewery. Due to many name similarities, the family changed their name to Graf von Arco auf Valley. The last owner of the estate, Otto Reichsgraf von Arco auf Valley died in 1989. Since his death, his widow Monika Reichsgräfin von Arco auf Valley continued the brewery business. While the Graf Arco beer is no longer brewed at the old brewery location in the nearby Valley, the Bartewirt property and beer garden still belongs to the Arco family. Nowadays the beer is brewed only at the brewery location in Adldorf. 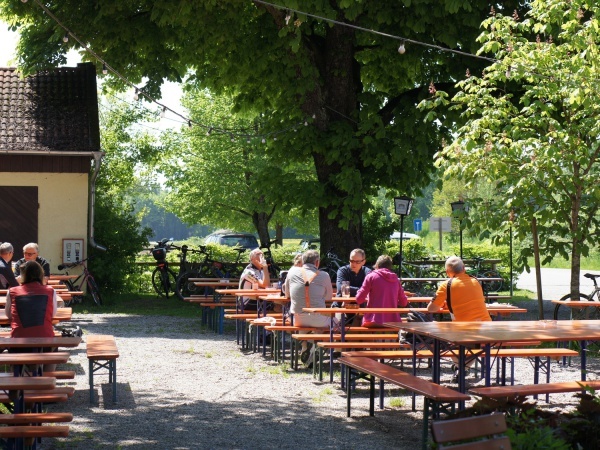 Zum Bartewirt was renovated in 2005 and serves Graf Arco beer fresh from the tap at €6.00 p/Maß (June 2014). The beer garden has 350 seats in the self-service area, partly shaded by trees and partly by sun-umbrellas. The served terrace has about 150 seats. The beer garden is open daily from 10am until midnight. Anton Graf von Arco auf Valley on Wikipedia. This page was last modified on 18 May 2018, at 19:03.